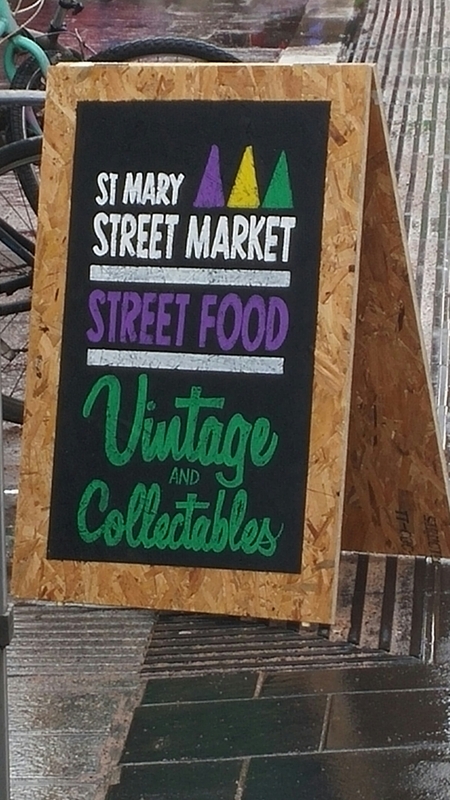 The hugely successful Riverside Farmers’ Market has spawned a number of littler versions (related and unrelated) with one of these being the Friday and Saturday markets on St. Mary Street, slap bang in the middle of Cardiff city centre. One such purveyor is Mr. Croquewich, who have been popping up at various farmers markets (included the Riverside Market and St. Mary Street Market) and street food event for some time, with their fine selection of grilled cheese sandwiches (or perhaps as they may say croquewiches). As a student in the 80s, I ate more than my fair share of toasted cheese sarnies cooked in what at the time I thought was the absolute bees knees, a Breville toastie maker. In hindsight, this thing was positively dangerous producing bread pockets of incendarily hot cheese and woe betide you if you added any tomato as that became hotter than the surface of the Sun. Third degree burns were an ever present risk and a bite into one usually resulted in an immediately howl of “holy f#&k that’s hot” – well at least it did with me (perhaps just “hot, hot, hot” from people more gentel than me). 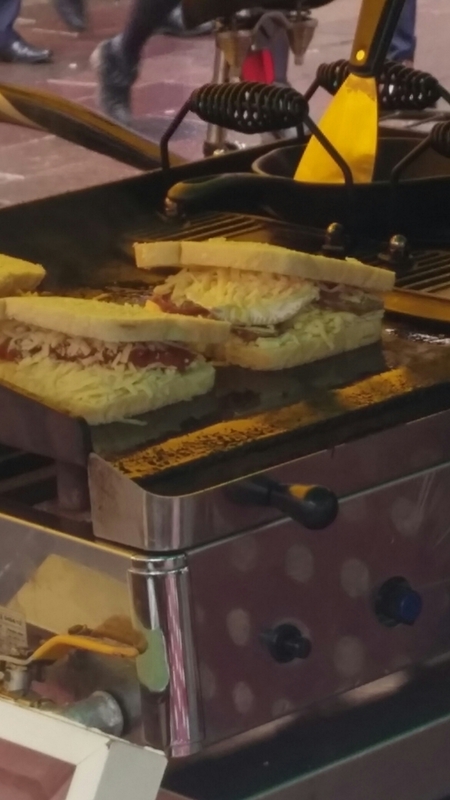 Your common or garden cheese and tomato sarnie are not to be had at Mr. Croquewich, with not a Breville in sight. What you get are lots of interesting flavour (substitute the slice of tasteless tomato for slow cooked tomato, garlic and herb compote) cooked on a flat iron grill (with loads of irons) and lots and lots (and I mean lots) of cheese. Mr. Croquewick’s grilled cheese sarnies are an altogether different and magnificently superior beast to my student day toasties. The menu is a mix of regular items, such as the Just Cheese (£3.00) and the Classic (£4.50) and on the day “specials”. They seriously load up their sarnies, with no skimping on the interesting and inventive fillings. Compared to the pathetic specimens you find in the identikit coffee shops chains (like Costa et al), these are positive behemonths (mine was the beauty cooking away on the left in the picture below). On one visit I (which happened to coincide with the Friday night Wales v France Six Nations game), I went for one of the “specials” that day in the form of “The French Connection” (£6). This consisted of really good quality (thick cut) saucisson sec, chaource (a new cheese on me and one that is brie like, but with a slightly chalkier texture – made in northern Burgundy in France and particularly in its namesake town of Chaource) and dijon mustard. The richness of the chaource (which brought an almost mushroomy taste to the proceeding ) and the saucisson was cut nicely by the dijon mustard. 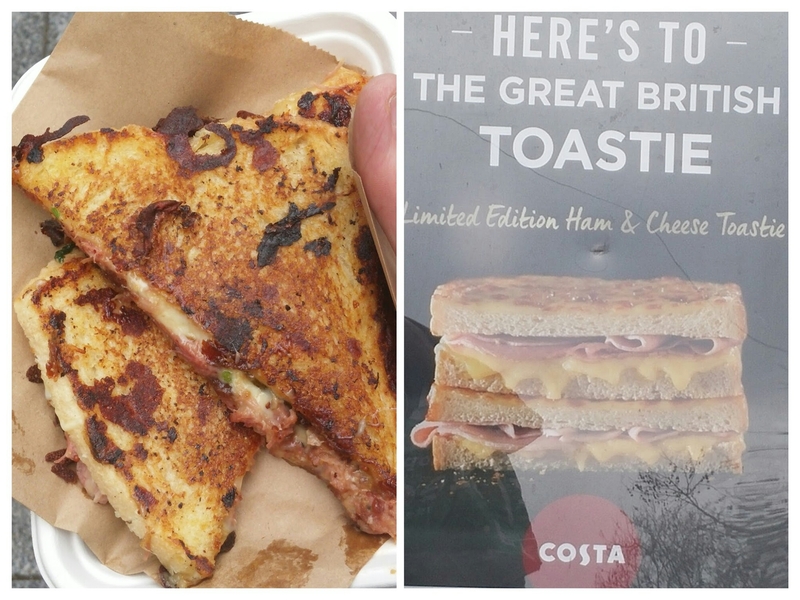 This was a blooming lovely sandwich, with perfectly melted cheese oozing everywhere. I especially loved the crispy bits on the outside. On a further visit I had the Classic, which was fabulous. A big hunk of homemade ham hock terrine, their blend of cheeses (melted to gooey perfection) and a great apple chutney which was both sweet and sharp. The latter acted perfectly as a counterpoint to the richness of the cheese mix and the ham hock terrine. A really very, very superior cheese and ham sarnie was the result. Breakfast is available earlier in the day with an eggy bread/French toast (something I have loved since early childhood) offering and dessert is also an option with cheesecake on offer as well. 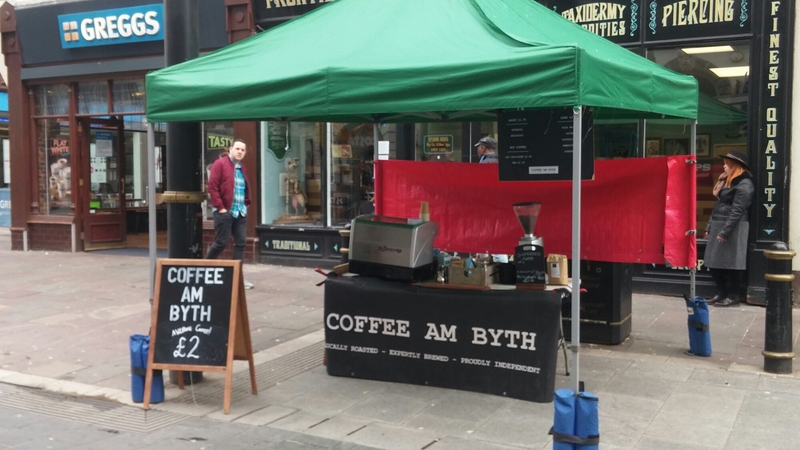 There are no drinks, but (at the St. Mary Street Market) good coffee at a decent price is usually available from Coffee am Byth. 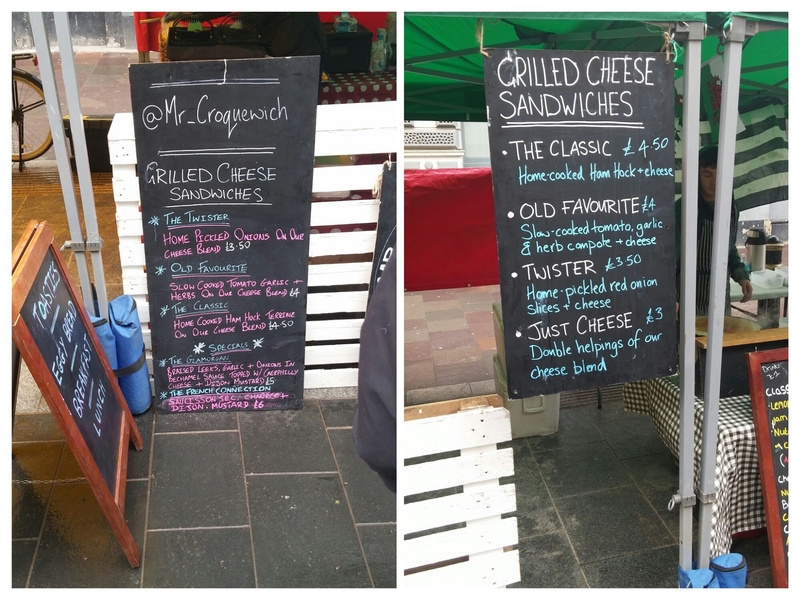 Mr. Croquewich has built up a loyal customer base with loads of people raving about their grilled cheese sarnies. I am one of them, with their sarnies being a really first class product. I absolutely love the flavours they deliver. There is no skimping on either quantity or quality here. No contest really is there! Mr. Croquewich wins by a country mile. Would I go back? Oh yes, Friday is very much “grilled cheese sandwich day” for me and what a lovely end of working week treat it is. Ooh could eat one right now. 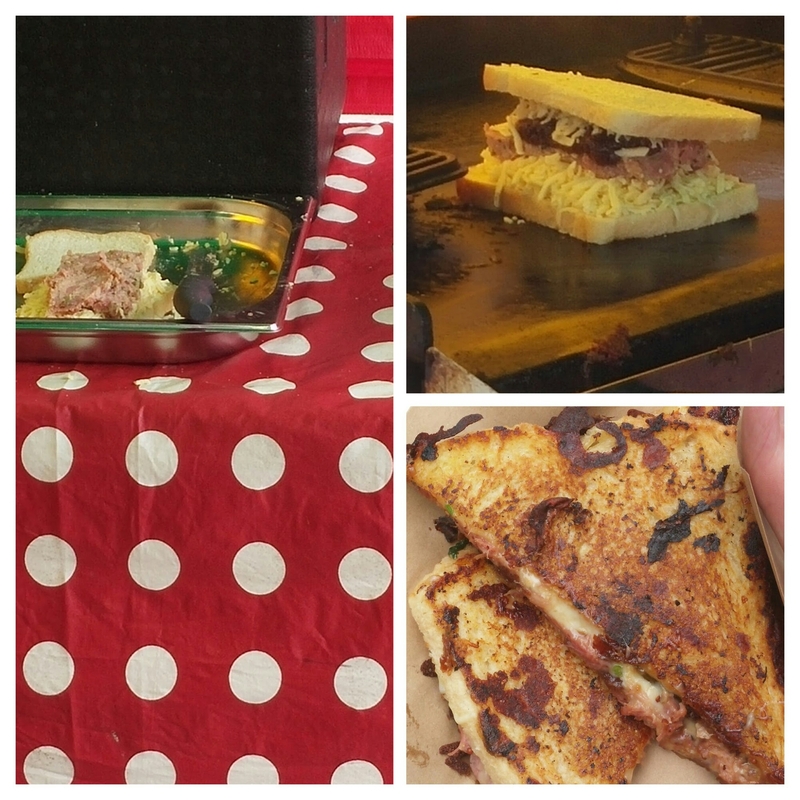 Seems Mr. Croquewich now pitches up at Riverside Market on Sundays – so catch him there for the ultimate hangover cure. 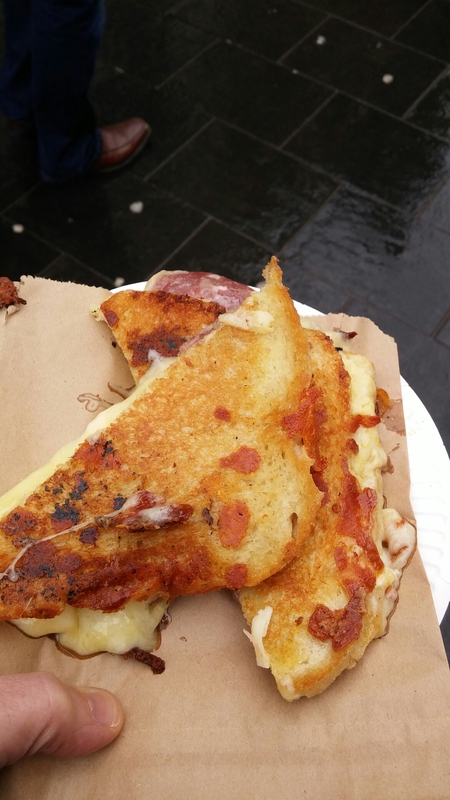 This entry was posted on Mar 20, 2016 by solicitingflavours in Breakfast, cake, Cardiff, charcuturie, cheese, Fast food, Food, France, lunch, lunchtime, Market, Mr. Croquewich, Non alcoholic drink, pop up, retail, review, Sandwich, St. Mary Street Market, Street food, Take away, Takeaway, Wales.